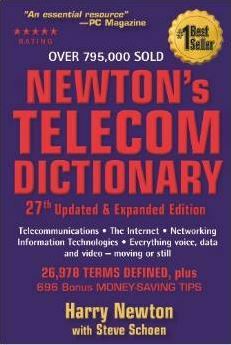 If you don’t already have Newton’s Telecom Dictionary, then you need to get it. Yes, it’s that good. If you are new to the IT field or a student working towards a career in IT, then this is a must have book. Why? Betazed – A planet in the second Star Trek TV series, inhabited by Betazoids, beings with great powers of empathy and telepathy. Bunny Suit – A layered, hooded outfit that covers every part of your body, except your eyes. Bunny suits are worn by people who work in places where cleanliness is absolute. The human skin sheds about 30,000 particles of skin a second. If one of these particles made it into a semiconductor or a piece of optical fiber it could seriously impair the usability of the device. This book is a must have book for any IT person. It is full of helpful information and humor. Grab a copy and pick a random page and start reading….you will be hooked!! This entry was posted in Network Resources on November 24, 2014 by sr71rocks. Although I just recently started this blog, I had been thinking about it for several years. I had a lot of ideas, and even made notes about it. But I kept putting it off…just too busy. About a year ago, while researching Brocade switches, I found a great site just full of useful information (Cisco, Brocade, ShoreTel, firewalls, and more), and I’ve been following it ever since. What surprised me though, was that his site looked just like the one I had envisioned. Somehow he must have hacked my computer and stolen all of my ideas! This entry was posted in Network Resources on September 3, 2014 by sr71rocks.